The word spondylolisthesis is derived from the Greek words spondylo, meaning spine, and listhesis, meaning to slip or slide. Spondylolisthesis is a descriptive term referring to slippage (usually forward) of a vertebra and the spine above it relative to the vertebra below it. Spondylolisthesis has many etiologies, all of which ultimately lead to a loss of the stability offered by the locking mechanism of the articular processes of the vertebrae that allow the superior vertebrae to slide forward over the inferior vertebrae. The etiologies can be classified as congenital (dysplastic), spondylolytic (isthmic), degenerative, traumatic, pathologic, or iatrogenic (eg, postoperative). The spondylolytic type is the most common form of spondylolisthesis. It affects the region of the pars interarticularis, which is roughly the region of the junction of the pedicle and lamina, where the articular and transverse processes of the vertebrae arise. A defect at this point functionally separates the vertebral body, pedicle, and superior articular process from the inferior articular process and the remainder of the vertebrae. Thus, the defect cleaves the vertebra into 2 parts. The portion of the vertebra posterior to the defect remains fixed, and the anterior portions are free to potentially slip forward relative to the posterior structures and spine below. Note that a bilateral pars defect is needed to allow slippage. Lateral and anteroposterior plain radiographs of the lumbar spine should be obtained in patients with complaints of back pain. 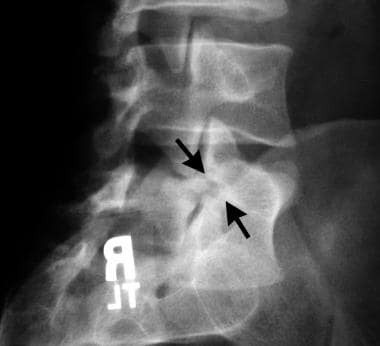 The lateral view (seen in the image below) is useful in detecting spondylolisthesis; it may demonstrate the pars defect. Spondylolisthesis. 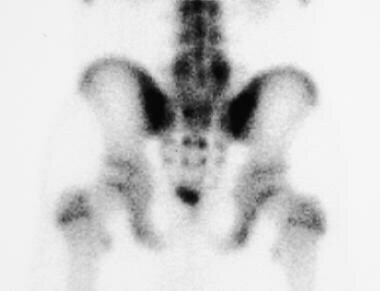 Straight lateral radiograph of the L4-S1 level of the spine shows a lucency at the pars area (arrow). 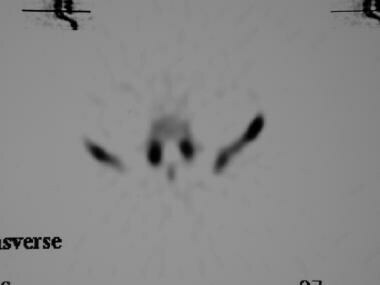 Bilateral pars defects must be present to visualize this in a lateral projection. Grade 1 spondylolisthesis is associated. Spondylolisthesis. Diagram in the oblique projection shows the components of the vertebrae that result in the appearance of a Scottie dog with a collar. In addition, plain radiographs also may demonstrate congenital types of spondylolisthesis and the changes of spondylosis. In the setting of trauma, fractures may be apparent. Note that other causes of the patient's symptoms may be demonstrated, such as an osteoid osteoma, Paget disease, and osteolytic lesions. The grade of spondylolisthesis can be measured by using the lateral view (as seen in the images below). Spondylolisthesis. Lateral lumbar spinal radiograph in a pediatric patient shows spondylolysis with grade 1 spondylolisthesis. Spondylolisthesis. Grade 4 traumatic spondylolisthesis. Cross-sectional imaging should be considered next. In patients with back pain and no clinical findings of nerve root involvement, computed tomography (CT) scanning of the lumbar spine yields information regarding spondylolisthesis and its cause, along with other possible conditions, such as disk disease, disk herniations, spondylosis, and spinal canal stenosis. Other associations, such as spina bifida, may be seen. In patients with radiculopathy, CT myelography can yield information regarding nerve-root impingement and its etiology, such as disk herniation, abscess, or neoplasm. CT scanning is more sensitive for detecting spondylolysis, but occasionally this can be missed, since scanning occurs in the plane of the spondylolysis or from volume averaging. Sagittal reconstruction images are of help in patients with these findings. A grading system of spondylolisthesis is shown in the image below. Spondylolisthesis. Diagram shows how to grade spondylolisthesis. The 2 arrows, one indicating vertebral body width and the other indicating the amount of slippage that has occurred, represent the measurements needed. The ratio of amount of slippage to vertebral-body width is obtained as a percentage. Grade 1 is a ratio of 0-25%, grade 2 is 25-50%, grade 3 is 50-75%, and grade 4 is 75-100%. The lateral view is especially useful in detecting spondylolisthesis. Moreover, the grade of spondylolisthesis is measured on the lateral view (as seen in the images below). The pars defect may or may not be visualized on the lateral view. Other causes of the patient's symptoms may be seen; these include an osteoid osteoma, Paget disease, and osteolytic lesions. Five-view plain radiography of the spine is the standard for a plain radiographic evaluation. Visualization of spondylolisthesis on standard radiographs, particularly lateral plain radiographs, confirms the presence of the condition. The etiology may not be readily evident, and other modalities may be needed for elucidation. CT scanning is perhaps the most valuable cross-sectional modality for this. 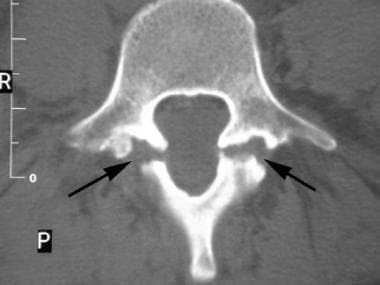 In the setting of trauma in a child, a pseudosubluxation of the vertebra in the cervical spine may be demonstrated; such a finding may cause some confusion with traumatic spondylolisthesis. Clinical correlation may be helpful, since focal tenderness at that level may require further evaluation clinically and/or radiologically; CT scanning may be needed. 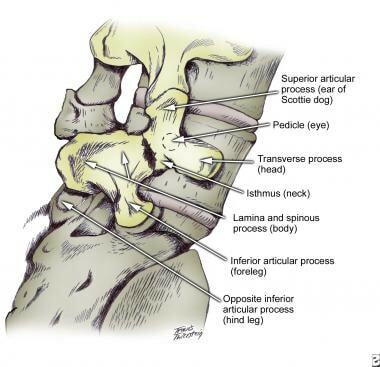 No normal variants have been identified that mimic spondylolysis or degenerative changes. In patients with back pain and no clinical findings of nerve root involvement, computed tomography (CT) scanning of the lumbar spine yields information regarding spondylolisthesis and its cause, along with other possible conditions, such as disk disease, disk herniations, spondylosis, and spinal canal stenosis. Other associations, such as spina bifida, may be seen. In patients with radiculopathy, CT myelography can yield information regarding nerve-root impingement and its etiology, such as disk herniation, abscess, or neoplasm. CT scanning of the spine can be performed with or without intrathecal contrast enhancement. Axial images are obtained in a plane parallel to the disk spaces at each level imaged. Sagittal reconstruction images (seen below) are obtained by using post-acquisition processing software. Bone window (eg, 1500/300 HU) and soft-tissue window (eg, 300/30 HU) settings are used. Spondylolisthesis. 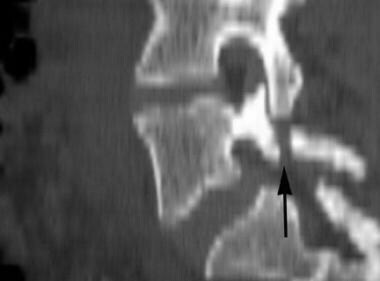 Sagittal CT reconstruction image shows the pars defect along with grade 1 spondylolisthesis (arrow). Spondylolisthesis. 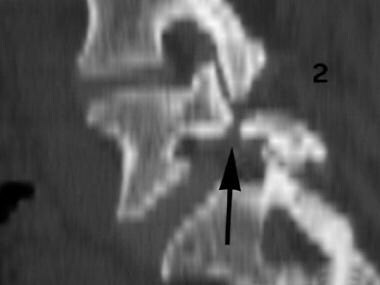 Sagittal CT reconstruction image shows the pars defect along with grade 1 spondylolisthesis. Thin sections should be used to avoid problems, such as volume averaging. (Contiguous images also reduce such problems.) 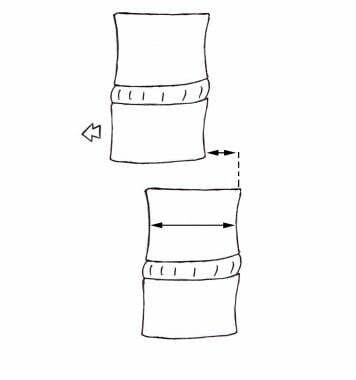 Indeed, if the sections are too thick and if a gap is present between sections, spondylolysis can be missed. In such cases, sagittal reconstructions may be of help in showing spondylolysis. With spondylolysis, CT is performed as close as possible to an angle that is 90° to the level of interest. CT scans typically demonstrate a horizontally oriented defect in the pars, which interrupts the normally complete bony ring of the posterior elements. 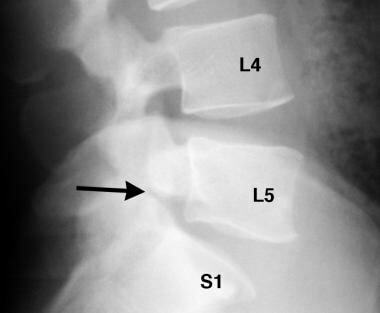 Spondylolisthesis is evaluated best on lateral topogram, but it can be suggested in patients with spinal stenosis in the absence of disk pathology, posterior hypertrophic changes, or a congenitally narrow spinal canal. One typically looks for an elongated spinal canal (as seen in the images below). Spondylolisthesis. 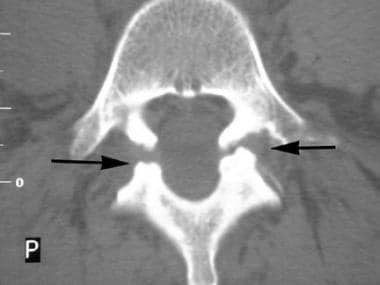 Axial CT image shows bilateral spondylolysis (arrows). Note elongation of the spinal canal at this level. CT scans can also demonstrate findings of congenital/dysplastic and degenerative types of spondylolisthesis. Abnormalities of the vertebral body or articular processes may be present. Changes of spondylosis deformans (degenerative changes) are apparent on CT scans. Degenerative disease of the spine has a characteristic appearance involving a loss of disk space height with or without the presence of vacuum phenomenon, narrowing of the facet joint space, subchondral sclerosis, osteophyte formation, and subchondral cysts. Some or all of the changes may be present and cause altered alignment of the facet-joint articular surface, leading to slippage. Spinal canal and/or intervertebral neural foraminal stenosis may be present. In traumatic spondylolisthesis, findings may include jumped facets and fractures of the articular processes and/or lamina that result in spondylolisthesis. Usually, CT findings confirm the presence of spondylolisthesis, its etiologies, and potential complications. MRI provides complementary imaging in some patients with traumatic spondylolisthesis in whom information regarding ligamentous and spinal cord integrity is required. One of the limitations of CT scanning is that it does not demonstrate ligamentous injury well. Spin-echo and fast spin-echo sequences are applied for image acquisition in these planes. A fat-saturation technique can be applied to minimize signal from fat and to bring out signal from fluid structures (eg, bone edema). Gradient-echo sequences can also be used; they have the advantage of faster image acquisition, limiting problems related to motion. In a postoperative patient, consideration should be given to gadolinium enhancement with T1-weighted spin-echo sequences. Spondylolisthesis is confirmed by visualization on MRI. Spondylolysis may be difficult to appreciate, and plain radiographs and/or CT scans may be complementary in this regard. MRIs should be scrutinized for the presence of a spondylolisthesis and for any abnormality of the pars interarticularis, pedicles, or facet joints. Nerve structures, including those exiting neural foramina, and the spinal canal should be evaluated. A spondylolisthesis is best assessed on median sagittal images of the spine. The levels involved and the grade can be seen. 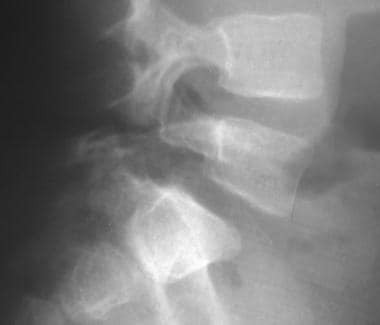 A spondylolysis pathologically can be a fibrous bridge or a pseudarthrosis, both of which have corticated/sclerotic margins in the adjacent portions of the bony ring. The bony sclerosis and fibrous tissue appear as an area of low signal intensity in the region of the pars interarticularis on images obtained with all sequences. This finding may not be easily seen and is a limitation of using MRI for spondylolysis. Similar signal-intensity changes in these areas may be seen with bony sclerosis, volume averaging with adjacent osteoarthritic facet joints, osteoblastic metastases, and even involvement of the pedicles with Paget disease. Even if one sees normal bone signal extending from the vertebral body to the pedicle into the lamina, it is not possible to exclude a spondylolysis because there may be minimal sclerosis in the bone and because its signal intensity is similar to that of posterior element bone. This is a limitation of MRI in detecting spondylolysis. High signal intensity may be seen in the pars interarticularis with T2-weighted sequences. This finding indicates the presence of fluid, a pseudarthrosis, or bone edema from infection. Degenerative disease can also be seen. [16, 17] Narrowed disk space, with disk desiccation (low T2 signal intensity), should be sought. This disk narrowing causes superoinferior subluxation at the facet joint at the level of disease, resulting in anterolisthesis or retrolisthesis. 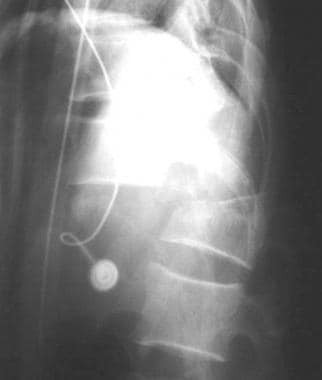 Reactive marrow changes should also be sought; these are seen in portions of vertebral body adjacent to disks and also in marrow adjacent to facet joints and may result in abnormal signal intensity in the pars interarticularis. Neoplastic disease involving the pars interarticularis or other parts of the vertebra typically yields low marrow signal intensity with all sequences. Infection may be evident as fluid signal intensity (bright on T2-weighted MRIs) from bone edema. Both disease processes show enhancement with a gadolinium-based contrast agent. Other diseases causing a sclerotic response (eg, Paget disease) result in low signal intensity with all sequences. Nuclear medicine has no role as a primary imaging modality in spondylolisthesis. Spondylolysis can be detected as areas of increased activity on bone scans, but the appearance is nonspecific, and such findings may be seen in other disorders (eg, neoplasms and infections). Usually, correlation with clinical and plain radiographic findings is helpful in narrowing the differential diagnosis. Nuclear medicine imaging involves the use of diphosphonates labeled with technetium-99m (99mTc). This is administered intravenously, and planar images of the whole body are acquired (as seen in the image below). Spondylolisthesis. Planar image of lumbar spine in a 14-year-old with back pain. Note hot spots at L5 in the region, where one would see the pedicles end-on on a plain radiograph. High count (1000 k) spot views of the lumbar spine are also obtained. 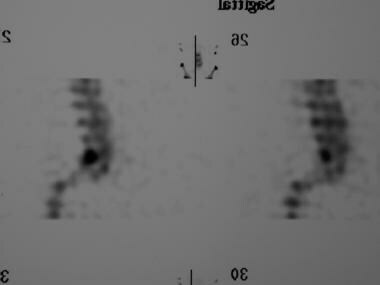 Single-photon emission CT (SPECT) scanning, used to produce the images below, is a more powerful way to detect areas of increased activity that may not be readily apparent on planar images. Spondylolisthesis. 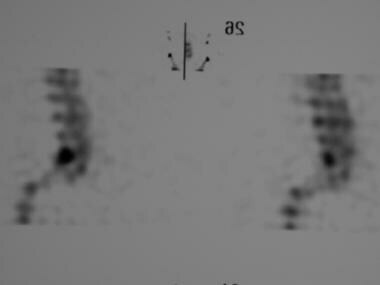 Axial single-photon emission CT (SPECT) image shows bilateral hot spots in the pars; these indicate spondylolysis. Spondylolisthesis. 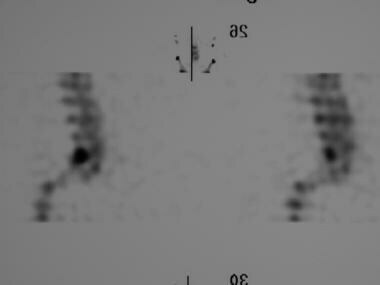 Coronal single-photon emission CT (SPECT) image shows bilateral hot spots in the pars; these indicate active spondylolysis. Spondylolisthesis. 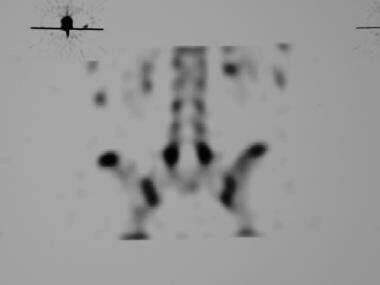 Sagittal single-photon emission CT (SPECT) image shows hot spots in the pars; these indicate active spondylolysis. Canale S. Campbell's Operative Orthopedics. Vol 3. 9th ed. St Louis: Mosby-Year Book. 1998. Petersen T, Laslett M, Juhl C. Clinical classification in low back pain: best-evidence diagnostic rules based on systematic reviews. BMC Musculoskelet Disord. 2017 May 12. 18 (1):188. [Medline]. [Full Text]. Daghighi MH, Poureisa M, Arablou F, Fouladi DF. Supine spinal magnetic resonance imaging with straightened lower extremities in spondylolisthesis: a comparison with the conventional technique. Eur J Radiol. 2015 May. 84 (5):921-6. [Medline]. Kanno H, Ozawa H, Koizumi Y, Morozumi N, Aizawa T, Ishii Y, et al. Changes in lumbar spondylolisthesis on axial-loaded MRI: do they reproduce the positional changes in the degree of olisthesis observed on X-ray images in the standing position?. Spine J. 2015 Jun 1. 15 (6):1255-62. [Medline]. Nakayama T, Ehara S. Spondylolytic spondylolisthesis: various imaging features and natural courses. Jpn J Radiol. 2015 Jan. 33 (1):3-12. [Medline]. Segebarth B, Kurd MF, Haug PH, Davis R. Routine Upright Imaging for Evaluating Degenerative Lumbar Stenosis: Incidence of Degenerative Spondylolisthesis Missed on Supine MRI. J Spinal Disord Tech. 2015 Dec. 28 (10):394-7. [Medline]. Özdoğan S, Kaya M, Demirel N, Düzkalır AH, Yaltırık CK. Isolated C5 Vertebrae Dislocation with Trauma: An Extremely Rare Case of Isolated C5 Dislocation. Am J Case Rep. 2017 Nov 28. 18:1256-1260. [Medline]. [Full Text]. Smith JS, Shaffrey CI, Fu KM, Scheer JK, Bess S, Lafage V, et al. Clinical and radiographic evaluation of the adult spinal deformity patient. Neurosurg Clin N Am. 2013 Apr. 24(2):143-56. [Medline]. Jeong HY, You JW, Sohn HM, Park SH. Radiologic evaluation of degeneration in isthmic and degenerative spondylolisthesis. Asian Spine J. 2013 Mar. 7(1):25-33. [Medline]. [Full Text]. Amato M, Totty WG, Gilula LA. Spondylolysis of the lumbar spine: demonstration of defects and laminal fragmentation. Radiology. 1984 Dec. 153(3):627-9. [Medline]. Epstein NE, Hollingsworth RD. Nursing review of diagnosis and treatment of lumbar degenerative spondylolisthesis. Surg Neurol Int. 2017. 8:246. [Medline]. [Full Text]. Khelifi A, Saadaoui F. Traumatic Spondylolisthesis of the Axis. N Engl J Med. 2017 May 4. 376 (18):1782. [Medline]. [Full Text]. Kovacs FM, Royuela A, Jensen TS, Estremera A, Amengual G, Muriel A, et al. 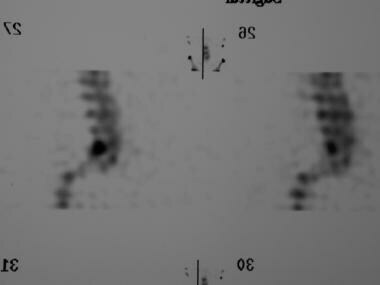 Agreement in the interpretation of magnetic resonance images of the lumbar spine. Acta Radiol. 2009 Jun. 50(5):497-506. [Medline]. Chung JY, Kim SK, Jung ST, Lee KB, Seo HY, Hu CY, et al. 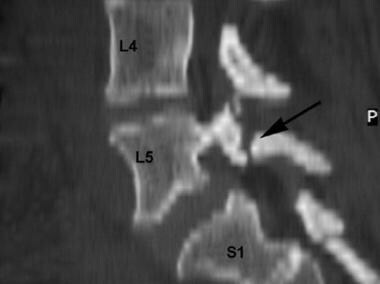 Spontaneous reduction finding: magnetic resonance imaging evaluation of segmental instability in spondylolisthesis. Asian Spine J. 2012 Dec. 6(4):221-6. [Medline]. [Full Text]. Chaput CD, Allred JJ, Pandorf JJ, Song J, Rahm MD. The significance of facet joint cross-sectional area on magnetic resonance imaging in relationship to cervical degenerative spondylolisthesis. Spine J. 2013 Feb 25. [Medline]. Kraft CN, Pennekamp PH, Becker U, Yong M, Diedrich O, Lüring C, et al. Magnetic Resonance Imaging Findings of the Lumbar Spine in Elite Horseback Riders: Correlations With Back Pain, Body Mass Index, Trunk/Leg-Length Coefficient, and Riding Discipline. Am J Sports Med. 2009 Jul 2. [Medline]. Huang KY, Lin RM, Lee YL, Li JD. Factors affecting disability and physical function in degenerative lumbar spondylolisthesis of L4-5: evaluation with axially loaded MRI. Eur Spine J. 2009 Dec. 18(12):1851-7. [Medline]. Spondylolisthesis. The appearance of a Scottie dog with a collar has been outlined in the normal vertebra, with the pars defect (the collar) shown by the arrows.